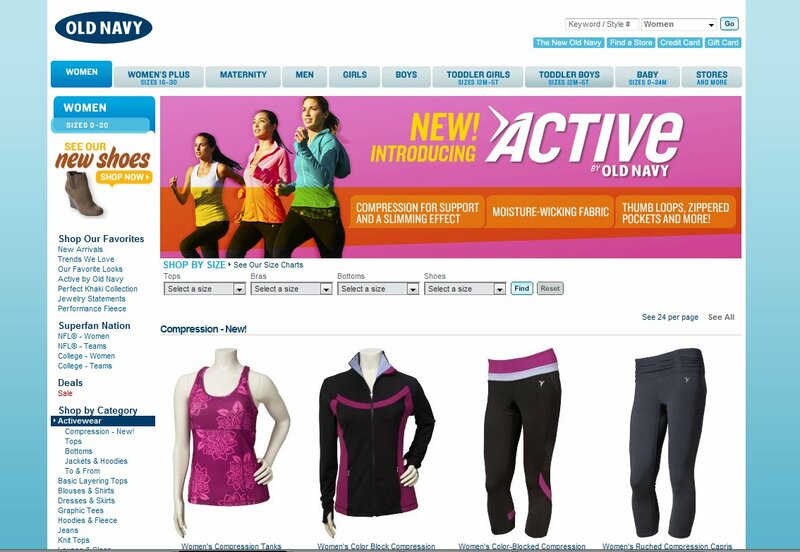 Old Navy has come out with a new line of compression activewear. They feature fabrics that wick moisture and provide support. Other features include thumb loops in the cuffs to keep your hands warm and zippered pockets. I went to our local Old Navy with my sister and my 4 year old and 1 year old. My sister also had a coupon for a free top and compression pants. They had a large selection of items to choose from. We probably spent a good 20 minutes just browsing around looking for things to try on. When we finally made it to the dressing rooms, we each had 9 things in our hand. We both tried on the Color Block Compression Jacket and actually both ended up choosing to buy it. My sister got it in the Carbon and I got it in the Black Jack. I loved how well it fit. It's very form fitting, but not uncomfortably tight. The fabric is very smooth and isn't scratchy against your skin. I love how it isn't just one plain color. The one I chose was black with a pop of fuchsia. It has zippered pockets on the side and my favorite part -- thumb holes in the cuffs! I know I'm always pulling my sleeves down over my hand when I get cold. This jacket has holes that you can slip your thumbs in to help keep you warm! We each chose a different bottom. My sister got the Cropped Compression Leggings. They have a 28" inseam and were perfect for my sister since she's about 5'3". They feature a back zippered pocket to put your keys or other small items. My sister has recently gotten back into running and with it getting dark earlier, she loves that they have the reflective trim down the side. She loved the outfit she ended up getting and felt she really looked like a runner in it. I ended up getting the Active Compression Pants in Black Jack. These pants are amazing! They fit so well and are very slimming. I tried on the leggings that my sister got but didn't like the taper at the bottom. I like how these pants have the boot cut and the pant legs flare out over my sneakers. I'm 5'6" and felt the length was perfect. 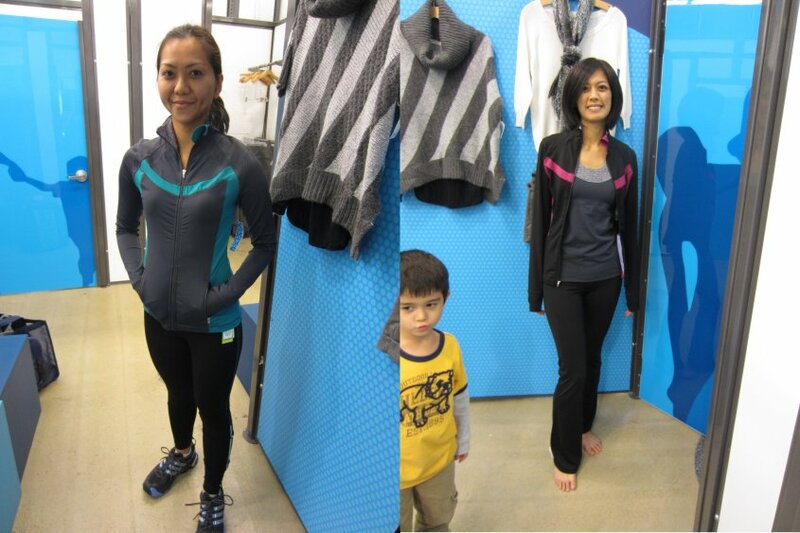 These also feature the same moisture-wicking fabric and exterior zippered pocket. It also comes in two other colors that feature a contrasting printed yoke. Overall, we're both happy with our purchases. I'm hoping to go back and get other items in the Active line. I'm hoping to pick up some capris and one of the Hooded Running Tops. Yes! They're a great buy! I love the pair of compression pants that I got and wear them all the time. Even when I'm not working out. They're super comfortable. I can even sleep in them. 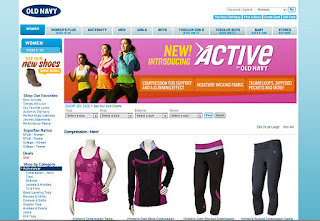 The whole line of Active products are great and are at an unbeatable price! They're often on sale too. How much does it cost? Regular prices range from $14.50 - $44.94. Where can I buy it? In Old Navy stores and oldnavy.com.